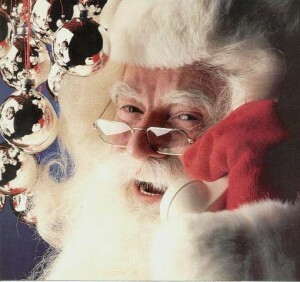 Doug Mellor played Santa Claus professionally for 50 years for commercial purposes only. Very rarely did he perform for children. During the late 1970s through the early 1990s, Mellor’s Santa modeling career took off. He appeared in print advertisements and television commercials for Sears, Jell-O, Archway Cookies, McDonalds, and several other top companies. Mellor also appeared numerous times on the cover of the Christmas issues of McCall’s magazine. At 5″5’ tall, clean shaven and naturally slender in real life, Mellor padded his 155 pound frame up to a size 62 inch waist along with wearing lifts in his boots. His custom handmade yak hair wig, mustache and beard completed the perfect commercial Santa look.